NDC 24909-740 Cbdmedic Arthritis Pain Relief Menthol. Proprietary Name: Cbdmedic Arthritis Pain Relief What is the Proprietary Name? Non-Proprietary Name: Menthol. What is the Non-Proprietary Name? 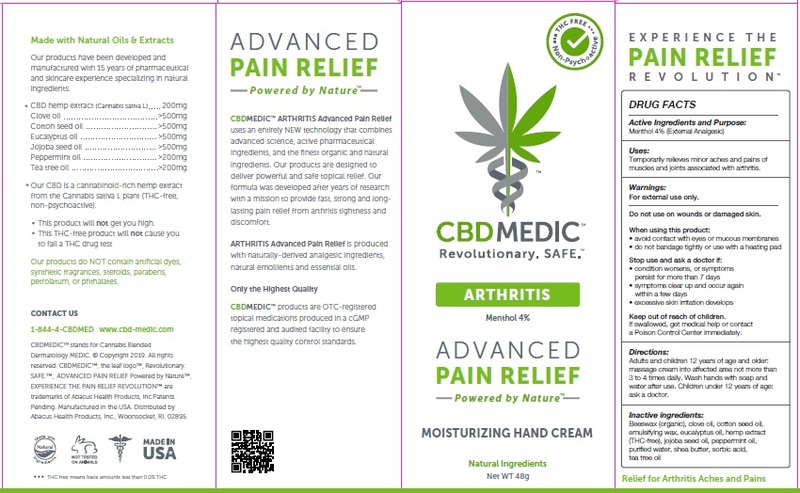 Cbdmedic Arthritis Pain Relief with NDC 24909-740 is a a human over the counter drug product labeled by Aidance Skincare & Topical Solutions, Llc. The generic name of Cbdmedic Arthritis Pain Relief is menthol.. The product's dosage form is cream and is administered via topical form. Temporarily relieves minor aches and pains of muscles and joints associated with arthritis. Adults and children 12 years of age and older: massage cream into affected area not more than 3 to 4 times daily. Wash hands with soap and water after use. Children under 12 years of age: ask a doctor.